Orders placed before 2pm will be processed on the same day (Monday to Friday, except Bank Holidays). 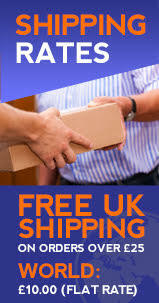 For orders within the UK shipping is free for orders over £25.00. (Your items will be sent via Royal Mail 2nd Class Signed For or via a Tracked Courier Service). For orders under £25 shipping within the UK is £4.00. Royal Mail Signed For™ 1st Class shipping within the UK is £6.00. Royal Mail Next Day Special Delivery Guaranteed™ shipping within the UK is £10.00. Outside the UK, Europe and Worldwide is a flat £10.00 per order - unlimited products! Please be aware that we sometimes use a shipping hub called Skynet as our international shipping service. They email you directly with shipping confirmation.